Recently, we moved into a Seattle downtown condo, 1,500 square feet of urban living. It’s been great so far, but I was a bit worried about having enough room when our second son comes home during his college breaks. Surprisingly, however, all of us living in such close proximity of each other has been yet another benefit of living in the condo. Our lives together now remind us about our two years together in a flat (about the same size) in London when our sons were pre-teens. We were constantly in each other’s space. This made all of us much more aware and involved in one another’s lives. We couldn’t help it, we overheard each other and shared our spaces all the time. We felt more connected as a family. Whenever there were family decisions to be made, everyone already understood the rationales. While in our 4,300 square feet suburban house on Mercer Island, however, the boys had their own spaces. Everyone disappeared into their own rooms. It was difficult to know much about each person’s lives. Ironically, the big dream family house made staying connected as a family more difficult. Now, as we again live together in our smallish urban setting, we are communicating much more. We have to learn to cooperate as we share bathrooms, televisions and the general living area. We are becoming a closer family again. In the same way, companies need to “narrow” the proximity between colleagues in the work place to improve communication and align goals. In a startup environment, people are many times crammed together in a makeshift office, where everyone can hear each other’s conversations. Those are often times remembered fondly by employees as the best times. That’s because everyone is so connected. Such environments, however, naturally change as companies grow. Slowly, the “big house” effect eventually disconnects the team over time. I believe management should try more proactively to retain the “small condo” connections between all employees. Social media tools, if deployed correctly, can help. For Lift9, we use Yammer to allow the “eavesdropping” of internal conversations. 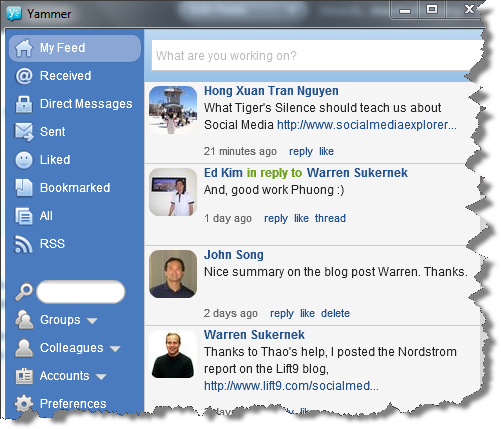 Yammer is an inside the enterprise microblog tool (like Twitter) that allows individuals to post tweet-like comments inside the company’s firewall. Since we have offices in Seattle and Ho Chi Minh, staying connected is a big challenge, but an important one for us to overcome in order to be successful. Of course, we share sales wins and give “shout outs” for outstanding efforts. Just as importantly, we also share what we had for lunch and who won at a particular Vietnamese card game. In this way, we build connections across different cultures to form what is the Lift9’s unique corporate culture. We encourage almost any kind of chatter as those give glimpses to each other’s lives, personalities. That’s like watching one of my boys play an Xbox game even though there is a football game on the TV. I feel more connected to his life from the experience. Posted in Management, People & Culture and tagged communciation, family, startups, Yammer. Bookmark the permalink.